Background and Purpose: The drought-induced vitality loss of sessile oak (Quercus petraea (Matt.) Liebl.) has been continuously observed in Hungary for more than three decades. The decrease in stand density as a consequence of drought-induced mortality has not been taken into consideration in most of the monitoring methods. Materials and Methods: Forest stands without any forest intervention during the last 30 years were selected. Quadrats were designated for the analysis in 18 sessile oak stands along a climatic transect in which foliage transparency and stand density were measured. Drought stress was defined by the water balance approach. By combining the foliage transparency and the relative stand density, a new cumulative assessment method of stand level vitality was introduced to get a more realistic picture about the effects of long-term drought (lasting for several decades) on the sessile oak forests in South-East Europe. Results: The calculated health status (100% - vital; 0% - dead) of the sessile oak stands was between 70-90% in the moist South-West Hungary and below 50% close to its xeric limit. The individual tree-based vitality assessment method gave considerably higher values on 17 out of 18 sites. Conclusions: Forest monitoring should also consider stand level-based tree mortality in oak forests while assessing health condition especially close to its xeric limit. The proposed new method provides a more realistic picture about the effects of climate change on sessile oak stands particularly for forest managers interested in changing in the wood stock of forests. Global climate change, in particular warming, has been observed in all parts of the world , including Europe, where several severe drought periods have occurred during the last decades . The climate of the Carpathian basin has also become more arid during the last 50 years. The mean annual temperature has increased while precipitation during vegetation season has decreased [3, 4]. In the future, the frequency and probability of drought periods may increase, resulting in higher evapotranspiration [5-8] and prolonged water stress. Since the mid 1970s, droughts tended to occur in subsequent years in Hungary, which led to prolonged water deficits, partly owing to higher evapotranspiration caused by higher temperatures during the growing season . Since water is one of the limiting resources for trees on the xeric limit, and since it is also needed for transporting nutrients, drought could decrease the vitality of trees , reduce tree growth [11, 12], alter their crown leaf structures with increased percentages of defoliation,  and ultimately lead to tree death , consequently reducing stand density . Sessile oak (Quercus petraea (Matt.) Liebl.) forests are one of the most important forest communities in the Carpathian basin, covering 20.8% of the total forested area in Hungary. Since the early 1980s, the severe dry periods have triggered mass mortality of stand-forming forest tree species including Quercus petraea [16, 17]. The multiyear drought in the beginning of the 1990s was especially severe and affected oak forests mainly in the northeastern part of Hungary. These episodic diebacks acted as a self-thinning mechanism to adapt tree density to decreased soil water resources during acute summer droughts. Different approaches (e.g. ecophysiological, dendroecological, growth modelling) used for the evaluation of stand density change might give different insights [18, 19], but reduced stand density increases water resources, nutrient and light for the retained trees by decreasing competition and canopy interception . Therefore, stand opening could facilitate the regeneration of the surviving trees after drought periods [20, 21]. Improved water availability may reduce the risks of cavitation for trees and thus have a positive effect on stomata opening and consequently also on carbon uptake and growth. The results by McMahon et al. indicated an increase for living above-ground forest biomass in the Mid-Atlantic region of the United States, but failed to account past mortality rates that could explain the deviation from the expected rate of biomass change . Improving carbon uptake should mitigate further mortality by allowing the remaining trees to produce enough carbohydrates for their metabolism and defense against biotic attacks . Gracia et al. showed that thinning treatments of Quercus ilex L. facilitated to overcome severe drought episodes. Nevertheless, stand opening does not ultimately improve water availability since increasing light intensity may lead to a higher temperature at the ground level, which results in higher soil water evaporation and the development of a dense understorey vegetation. A recent study by Misik et al. showed that Acer campestre L. responded successfully to the foliage gaps of sessile oak trees by forming a subcanopy layer. However, the subsequent establishment of grasses after self-thinning could prevent retained trees from benefiting from increased available soil water . The Europe-wide existing forest monitoring system of ICP (International Cooperative Programme on Assessment and Monitoring of Air Pollution Effects on Forests - Level I) offers a suitable, continent-wide evaluation of the forest vitality . ICP was designed to detect and monitor changes of the health condition of living tree individuals annually. Thus, stand level data on Level I plots is not taken into account, although it might be an important indicator of the stand productivity for forest managers. In case of scattered and fragmented forest covers, a considerable number of grid intersections may fall outside of the forests, especially in semiarid regions at the retreating edge of the species distribution . We aimed (1) to extend the established and widely used individual tree-based vitality assessment method with a stand level-based approach for oak forests near the xeric limit which incorporates the effects of the former mortality events through stand density. We have compared the results (2) of the different approaches along a climatic transect in Hungary. Forest stands without any forest intervention during the last 30 years were selected since a middle-aged sessile oak stand under average weather conditions in Hungary could outgrow an intermediate thinning (30%) within three decades . Stands with wind/snow throw, nitrogen deficiency or pest outbreaks were excluded, resulting that the observed tree mortality was triggered exclusively by drought-induced mortality. A 50x50 m quadrat was designated for the analysis in 18 sessile oak stands along the climatic transect from the humid region in South-West Hungary to the continental-semiarid region in North-East Hungary in 2011 (Figure 1). The 60-100 years old sessile oak stands are situated in zonal position without major confounding factors among the stands (e.g. exposition, steep slope, seeping water). The mean annual precipitation sum ranges from 550 mm to 730 mm. The mean annual air temperature changes between 8.5°C and 10.8°C . 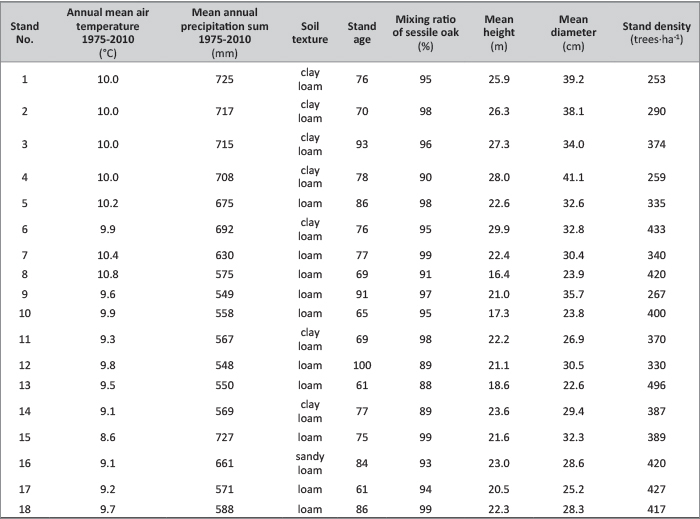 The soil texture of the stands is loam and the soil can be characterized by deep fertile upper layer (>10 cm) in all sites (Table 1). Foliage transparency is defined as the additional amount of skylight visible through the crown compared to the amount of skylight visible through a fully foliated crown. Foliage transparency was estimated in 5% classes by always the same observer based on the live, normally foliated portion of the crown and branches, excluding branches and large spaces between them . The water balance model of Thornthwaite and Mather  was applied to quantify the climatic water stress for the stands between 1961 and 2010. Monthly weather data were provided by the CARPATCLIM Database  and interpolated climate data outside of CARPATCLIM target area provided by the Hungarian Meteorological Service (OMSz) were used. The maximum extractable soil water (EWm) was derived from soil texture and rooting depth using soil pit data of the assessed quadrats. The thinning of the crown and top drying are among the typical consequences of prolonged droughts. Eventually, a major part of the affected trees recover from the decline, but some trees die due to the severe conditions which reduce stand density. The fully stocked density of a stand is regulated by self-thinning [34, 35]. We have applied the yield tables of sessile oak in Hungary using the average yield class (III.) to determine the fully stocked density corresponding to the mean stem diameter of the stand. The yield tables were defined in the 1960s when there have not been any significant dry periods causing mass oak mortality yet, and therefore we considered these tables describing healthy stands. The relative stand density ranged from 57% to 101% in 2011 in the studied quadrats. As an example, there was a major difference in the relative stand density between two stands (Bak-No.6 and Galgamácsa-No.12) with similar average stem diameters (33 cm and 30 cm respectively) (Figure 2). The sessile oak stand No. 6 (age: 76 years) is located in the humid south-west part of the country while No. 12 (age: 100 years) is located near the xeric limit of the sessile oak distribution. The prolonged droughts in the past have reduced the relative stand density to 65% in No. 12, while in No. 6 the stand density was significantly larger with 101 %. Field observations showed that the mean foliage transparencies were low (below 27%) in all studied stands with varying relative stand density. The stand level-based method showed that the vitality status (Hsta%) of the sessile oak stands was between 70% and 90% in the humid southwestern region of Hungary while it was below 50% near its xeric limit in 2011 (Figure 3). Prolonged droughts triggered a significant decrease of the relative stand density in the semiarid regions, while foliage transparency of the survived trees did not change significantly. The determination of the relative stand density by using yield tables constituted one of the main uncertainties of the study. We assumed that the yield tables defined 50 years ago showed the stand densities for completely healthy stands. Earlier research on oak in Hungary showed that the oak decline began only in the second half of the 1970s, and therefore this assumption could be justified [36, 37]. Moreover, the applied yield tables were defined for the whole country based on scattered measurements and not for specific forest locations. For this reason, we included only the plots with average yield class in the analysis and used the corresponding values in the yield tables. The long-term climatic water stress was defined using a simple water balance model  which originally was not intended to simulate water balance changes in the forested area. Unfortunately, water balance simulations could not be validated against measured soil water content, although the main aim was only to compare the climate conditions of the sites to each other. The application of a daily water balance model was omitted due to the need of a large number of variables and data to run the model. The probable cause of the favourable condition of trees in the thinned stands was that transpiration and rainfall interception of the stand have reduced significantly due to the mortality of trees, thus leaving more available water in the soil for the recovery of the survived trees . This way not only the available water in the soil has increased, but also the availability for nutrients. The potential use of the stand level-based vitality assessment in forest monitoring is limited due to the fact that forest stands without any forest intervention for at least three decades are needed. However, since our results include long-term changes due to drought events, we propose our stand level-based method as complementary to the ICP monitoring. The new method could be implemented on ICP plots situated in national parks, forest gene conservation areas and long-term experiment sites, especially along the xeric limits of tree species. We have introduced a new health assessment method for sessile oak which incorporated relative stand density as the indicator of extra tree mortality due to drought events. 18 sessile oak plots were investigated, on which the stand density and the current health status of trees were determined. 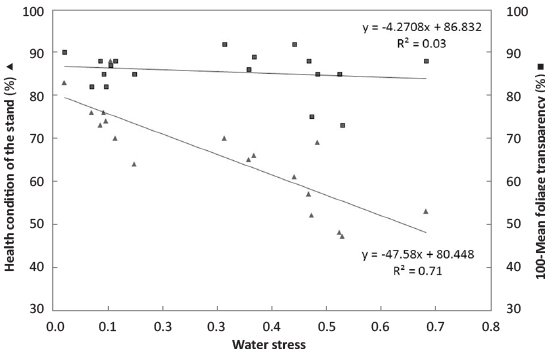 Additionally, the water stress was calculated for each plot using a robust water balance model. The results showed that the current health status of the stands was good in terms of foliage transparency regardless of the magnitude of the long-term water stress. However, if the relative stand density was included in the evaluation then the relationship between the water stress index and the health status became strong. The probable reason for the good condition of the surviving trees was greater availability of water and nutrients due to the extra thinning effect of tree mortality. The results suggest that forest monitoring should also consider stand-level data in oak forests while assessing the health condition. In our view, this new method provides a more realistic picture about the sessile oak stands, particularly for forest managers interested in changes in the wood stock of forests. The better understanding of the mortality dynamics of oak may also help to predict more reliably the possible shift of its distribution area due to future climate change. This research was funded by FORGER (FORGER - Towards the Sustainable Management of Forest Genetic Resources) and by the AGRARKLÍMA.2 VKSZ_12-1-2013-0034 projects. © 2016 by the Croatian Forest Research Institute. This is an Open Access paper distributed under the terms of the Creative Commons Attribution License (http://creativecommons.org/licenses/by/4.0).